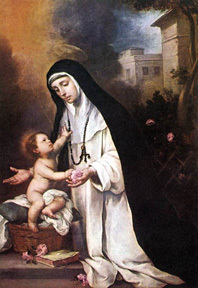 St. Rose of Lima, patroness of America was born at Lima, Peru April 20,1586. She had a great reverence, and pronounced love, for all things relating to God. She gave her life to prayer and mortification. She had an intense devotion to the Infant Jesus and His Blessed Mother, before whose altar she spent hours. She was scrupulously obedient and of untiring industry, making rapid progress by earnest attention to her parents' instruction, to her studies, and to her domestic work, especially with her needle. After reading of St. Catherine she determined to take that saint as her model. Many hours were spent before the Blessed Sacrament, which she received daily. She determined to take a vow of virginity. At the outset she had to combat the opposition of her parents, who wished her to marry. For ten years the struggle continued before she won, by patience and prayer, their consent to continue her mission. Her days were filled with acts of charity and industry, her exquisite lace and embroidery helping to support her home, while her nights were devoted to prayer and penance. When her work permitted, she retired to a little grotto which she had built, with her brother's aid, in their small garden, and there passed her nights in solitude and prayer. In her twentieth year she received the habit of St. Dominic. She offered to Him all her mortifications and penances in expiation for offenses against His Divine Majesty, for the idolatry of her country, for the conversion of sinners, and for the souls in Purgatory. She died August 30, 1617. Many miracles followed her death. She was beatified by Clement IX, in 1667, and canonized in 1671 by Clement X, the first American to be so honoured. She is represented wearing a crown of roses. "Let him who boasts, boast of the Lord." For it is not the man who commends himself that is accepted, but the man whom the Lord commends. I wish you would bear with me in a little foolishness. Do bear with me! I feel a divine jealousy for you, for I betrothed you to Christ to present you as a pure bride to her one husband. "Again, the kingdom of heaven is like a merchant in search of fine pearls, who, on finding one pearl of great value, went and sold all that he had and bought it.